It was January 1985. I was sitting with Swami Achalanandaji and discussing the qualities of an ideal student and that of an ideal Teacher (Guru). Swamiji was trying to explain to me Shankara’s Vivekachudamani, wherein Shankara so wonderfully describes these qualities. I felt them to be so ideal that i was left wondering if such people really exist. Suddenly Achalanandaji turned the conversation to another brother monk whom he said I had to meet. He said his name was Swami Sureshananda and he was the Correspondent of the Sri Ramakrishna Vidyashala at Mysore. He told me that this is was one person who lived by the Advaitic principles as elucidated by Shankara and I would indeed learn a lot by just being with him. Swami Sureshananda was fondly referred to by his pre-monastic name as Hari Maharaj. A few days later, I went to meet Swami Sureshanandaji. I found him sitting in his office surrounded by a noisy bunch of students. He was so warm and loving that I could not relate him to the dry ‘Advaita’ that I had read about. It seemed so improbable that a man of such scholarly distinction could relate to these 15 year olds as one of them. It also struck me that this was what living the ‘Advaitic’ principles could be about. It seemed to be akin to what Sri Ramakrishna told about being the lotus leaf in the water, living in the world but being unaffected by the happenings around you. I left after introducing myself and he urged me to visit another day. I went again a few days later and he welcomed me as though he knew me for a long time. I was so taken aback by the love and kindness that he showed me, that I was getting a little embarrassed. He took me to the dining room and personally made me coffee exactly to my liking. He sat and heard me narrate the story of Swami Vivekananda Youth Movement (not much in those days) and told me that I was infinitely lucky to have found someone like Swami Achalananda to guide me in my endeavour. He asked me to keep him updated of our activities and assured me of any support that I may require. From that day on, I was magnetically drawn to him and kept visiting him as often as I could. Even today, he continues to shower me with the same affection and love. 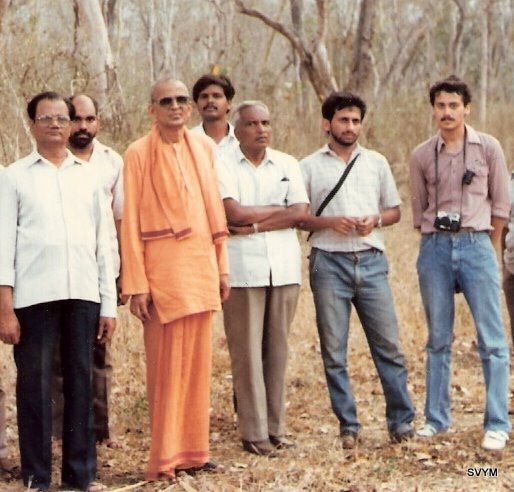 Even though he was a monk, what impressed me was his extraordinary managerial abilities and his fund raising prowess, which have made him a legend in the Ashram circles. His insights have helped me resolve conflicting situations and he has turned out to be one of the most valued advisers of SVYM. Amongst the few who helped build SVYM to what it is today, Swami Sureshananda stands out as the most practical; as one of the few who never let our values be compromised with, yet found out workable solutions for us. Looking back now, I think I can figure out why Achalanandaji wanted me to seek out Swami Sureshananda. But for his steadfast support at times when we were unknown, unrecognized and with no resources, we possibly may not have had Swami Vivekananda Youth Movement today at all. Today’s SVYM is testimony to his foresight, encouragement and inspiration. His now unfulfilled desire is to spend some time with us in a kuteera in our Saragur Campus. We could not fulfill this wish of Swami Achalanandaji; hopefully we will do it for Swami Sureshananda.